The Grom short-range ballistic missile (SRBM) would be a Ukrainian analog to the Russian 9K720 Iskander. 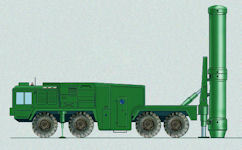 The Soviet-era 9K79 Tochka-U SRBM system, is currently the mainstay of the Ukrainian army's missile systems. Hypothetically, a customer could be either Saudi Arabia or the United Arab Emirates. For example, in 2003 representatives from UAE showed interest in Ukraine in terms of development and production of cruise missiles for the needs of the UAE air force and ballistic missiles. Even the commander of the air force and air defense UAE arrived in Kiev. In the summer of 2016, Ukrainian media reported that military engineers from the Yuzhnoye Design Bureau and the Pavlograd Chemical Plant had begun development work on the Grom-2 ('Thunder') system using money from a mysterious foreign client. That secret client was soon revealed to be Saudi Arabia, whose investors provided about one billion hryvnia ($40 million US) for the design and development of the ground-to-ground tactical short-range missile system. Saudi Arabia, they recalled, had unsuccessfully sought to obtain both Russian and American systems (the Iskander and the ATACMS, respectively), but has had no luck doing so. In January 2017, Russian media reports suggested that the Saudis had cut off funding, leading to the suspension of the program. It is possible that Riyadh was simply unsatisfied with the results of the first stage of R&D work. Alternatively, the Saudi partners themselves may have run out of money, or Ukraine could have been pressured to stop development by its Western allies. Another option, was that the Saudis may have never planned to see the project through to completion at all, and simply wanted access to the missile technology or its individual components. The Ukrainian press reported in August 2016 that military engineers had made significant progress in the development of the Grom, a new tactical ballistic missile system, with R&D funding provided by a mysterious foreign buyer. Local media in Ukraine's Dnepropetrovsk region launched a tirade against authorities in Kiev for the latter's supposed attempts to sabotage the creation of a new weapon, the Grom short-range ballistic missile (SRBM) system. According to Dnepropetrovsk's MOST news agency, Kiev officials are 'twisting the arms' of the Yuzhnoye Design Bureau and the Pavlograd Chemical Plant, two enterprises involved in creating the weapon. Engineers speaking to the news agency explained that the Grom was being developed using money from a mysterious foreign client. Moreover, the system, then in its third year of active development, will be prepared for testing as soon as the fall of 2016. Speaking to MOST, Pavlograd Chemical Plant general director Leonid Schiemann explained that after receiving private financing of about one billion hryvnia ($40 million), engineers have created the necessary manufacturing potential, restored laboratories, and engaged in the testing of the system's components. As a result, they were able to create a prototype of the weapon. According to Sheimann, Grom would allow the army to fight at a distance from the front lines in the civil war in eastern Ukraine, "and to preempt the attack of any aggressor." However, according to Evgeny Ustimenko, the plant's technical director, the policy of a number of institutions of the government in Kiev not only shows an unwillingness to stimulate the production of modern weapons system, but gives the impression of a purposeful campaign to destroy the country's leading defense enterprises. Work on the Grom complex was first announced at a defense exhibition in Kiev in 2014. A year later, it was announced that mass production of the weapon could begin as soon as 2018. Expected to have a firing range of 280 km (and the possibility of upgrades to up to 500 km), the system would replace the aging Soviet-era Tochka-U systems currently used by the Ukrainian military. The complex was expected to use the prospective 'Korshun' cruise missile to destroy ground targets. The system's designers asserted that the complex would be able to defeat the most advanced missile defense systems, including the Russian S-300 and S-400 systems. Like the Russian Iskander, Grom's missiles were expected to use unpredictable flight trajectories. Moreover, according to Svobodnaya Pressa military observer Anton Mardasov, the system's described 300 km range "is no more than a formal legal constraint associated with the Missile Technology Control Regime," a multilateral export control convention to which Ukraine is a partner. Domestically, the journalist noted, Ukraine would not be subject to that agreement's restrictions. Questions remained as to whether the Ukrainian military-industrial complex will actually be able to build the new weapon. 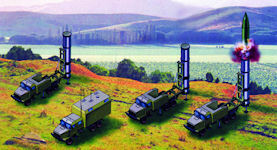 "The fate of the Borisfen and Sapsan missile systems, hatched earlier by Kiev, is well known. The former was scrapped due to a lack of funding in 2003. The latter was shuttered in 2013, after over 200 million hryvnia (about $24.5 million dollars at the time) was spent on it…"
The Grom design, too, actually dates back to 2003, but at that time Kiev lacked the funding to move forward. Following the February 2014 Maidan events, Kiev announced with great fanfare that projects such as Neptun (an anti-ship missile system), Olha (a ground-based missile system), and Korshun (a sea and ground-based cruise missile) would soon be realized. In the end, the Korshun, which remained untested, outwardly looks very similar to the long-range Soviet-era air-based Kh-55 cruise missile, while the Olha turned out to be just an ordinary round for a multiple launch rocket system (MLRS) used by the Soviet army. Still, the situation surrounding the Grom system may yet be different. Firstly, it is possible that this project will combine all the developments previously reported on by Kiev, resulting in movement toward the creation of a unified high-precision missile system. Second, the key factor limiting previous developments, including the Sapsan, had been financing. But if media reports are to be believed, Grom is being financed from abroad. This radically changes the picture. Accordingly, there were two important questions which require answers: "Is it possible that in the near future we will see Ukraine's 19th Missile Brigade, deployed in Khmelnitsky, armed with the Grom system? And who is the project's foreign sponsor?" Yuri Savelyev, a veteran rocket scientist and the former rector of the Baltic State Technical University, recalled that the United States had been actively cooperating with Ukraine in the field of rocketry. For instance, he said, in the 1990s,"Boeing took part in the 'Sea Launch' ocean-based space rocket project, using the [Ukrainian] Zenit-3SL, consisting of the Zenit-2S two-stage launch vehicle developed by Yuzhnoye design bureau, and the DM-SL booster, developed by Russia's Energiya design bureau outside Moscow." Still, the expert also suggested that he hasn't seen any evidence of US involvement in the Grom project. In fact, he believes that it's the German government that may be looking to use Ukrainian know-how to develop a new SRBM system. "Germany could be the sponsor…The German army is equipped only with the American MLRS M270. With the help of the Yuzhnoye and Yuzhmash design bureaus, the Germans would be able receive designs both for short-range ballistic missile systems, and, in the future, for long-range systems as well," Savelyev noted. For his part, Alexander Khramchikhin, deputy director of the Moscow-based Institute of Political & Military Analysis, suggested the mysterious foreign customers could be countries like Pakistan or North Korea, and possibly even Belarus. "According to some reports, representatives of Ukraine's Luch design bureau participated in the Sino-Belarusian project on the Polonez MLRS, recently successfully tested by Minsk," Khramchikhin said. However, Andrei Frolov, the editor-in-chief of Arms Export magazine, said he was very doubtful about Grom's prospects, pointing to a long list of failed projects previously announced by Ukrainian authorities, and Ukrainian designers' habit of putting a new label on old systems. With regard to the possible foreign sponsors, Frolov suggested that these could be Saudi Arabia or the United Arab Emirates. "As far back as 2003, representatives from the UAE showed interest in Ukraine for the development and production of cruise missiles for the UAE's air force, and in ballistic missiles. The commander of the country's air and air defense forces even visited Kiev." Moreover, Frolov recalled that "in March 2015, information appeared in the media that the Saudis are interested in the delivery of the first stages of the R-36M rocket (NATO classification SS-18 Satan)…As for Belarus, I do not think their budget could afford to purchase SRBM systems following the development of the Polonez. Moreover, if Minsk took such a step, it would receive strong pressure from Russia." Ultimately, the analyst warned that if Ukraine does manage to finish development of the Grom and actually build the system, its primary targets will be the rebellious regions of the Donbass. According to Ukrainian online news resource Apostrophe, Grom-2 is so advanced that it will change the balance of power between Ukraine and Russia, and allow the Ukrainian military to crush the fledgling breakaway republics in the war-torn Donbass region. Citing local experts, the outlet stressed that the Grom-2's range would allow its missiles to target Moscow, "and consequently, any attempt to launch full-scale aggression against Ukraine will end in us hitting targets on Russian territory." Russian commentators reacted to the latter kinds of statements with a mix of amusement and bewilderment, pointing out, first of all, that Russia is not in a state of war with Ukraine. Secondly, they noted, Kiev is formally committed to observing the Minsk agreements on ensuring peace in eastern Ukraine. Finally, Kiev is a party to several treaties, including the Intermediate-Range Nuclear Forces Treaty and the Missile Technology Control Regime, which ban the deployment and export of ballistic and cruise missile systems with a range above 500 km. With this in mind, given the fact that Moscow is more than 500 km from most of Ukraine's territory, experts are calling the Ukrainian media's bluff. Russian analyst Konstantin Sivkov explained that he frankly did not believe that the Ukrainian military industrial complex is in a state to develop such a system. "I do not think that Ukraine is capable of creating any sort of new superweapon, simply for the simple reasons that even the US does not have such a weapon," the analyst noted. Sivkov stressed that "the creation of a new superweapon is extremely difficult in all respects. At the same time, Ukraine has so far failed to create anything new even in the field of armored vehicles." Saudi Arabia was reported to have covertly financed R&D work on Grom-2, to the tune of one billion hryvnia (about $40 million dollars). BMPD, a military blog unofficially affiliated with the Center for Analysis of Strategies and Technologies, a respected Moscow-based think tank, revealed that the Grom-2 project was commissioned by the Saudis, who provided the Pavlograd Chemical Plant with about $40 million in financing to develop the missile complex for Riyadh. According to BMPD, the Saudis are looking for a system capable of firing both ballistic and cruise missiles interchangeably. Russian experts have scratched their heads in wonder over why Riyadh would make such an investment, given that they already have direct access to both American and Chinese missile systems, including the Dongfeng family of missiles. Russian observers' bewilderment has been furthered by the fact that the Pavlograd Chemical Plant, one of the two enterprises involved in creating Grom-2, is known in Ukraine only for the production of explosives, solid rocket fuel, and ballast for military applications. Accordingly, Sivkov suggested that Riyadh's financing of the Grom project is not so much a defense order as a veiled form of military aid, designed to create a Ukrainian analogue of Prompt Global Strike, a Pentagon initiative meant to overcome Russia's strategic deterrent using the massed launch of conventional cruise missiles. "The fact is that Russia today has sharply and practically reduced the possibility of Saudi Arabia establishing control over the Middle East," Sivkov stressed. "Therefore, it is likely that Riyadh feels a desire to spite Russia," he added. "At the same time, the Saudis never act directly; that is, they are ready to provide support in the form of cash. The Saudis have large financial resources, and seek to invest them somewhere. [Grom-2] is possibly this kind of disguised form of penetration into Ukraine." © AFP 2016/ ALEXANDER NEMENOV The Iskander ballistic missile launcher at a parade rehearsal. 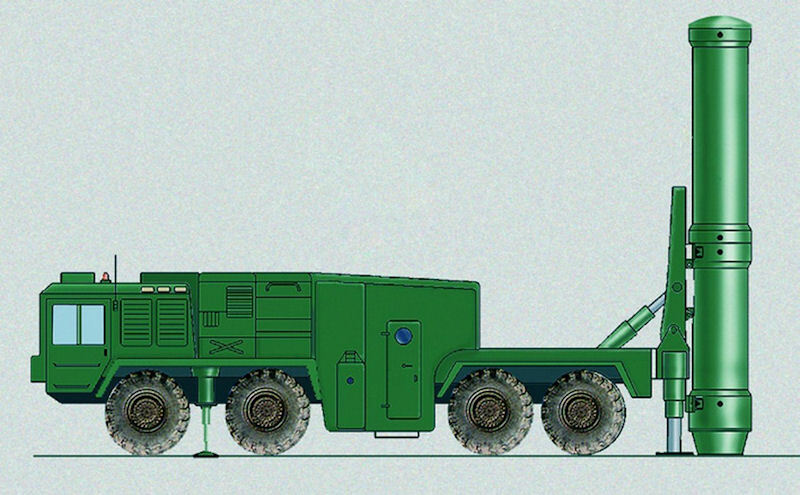 Grom-2 is ostensibly meant to compete with the Russian SRBM. Ultimately, military analysts say that whatever happens next, the actual production of the Grom-2 SRBM is a long way off; testing will require time and additional financial resources, and actually creating a production line would cost vast sums of money – something Ukraine's cash-strapped budget will have a difficult time paying for. Independent Ukraine has never developed or produced such systems. That's not even mentioning Russia's countermeasures, including its air and missile defense systems.